The following sermon was preached by Dr Thomas Winger in the seminary’s Martin Luther Chapel for the divine service commemorating St Joseph, Guardian of Jesus, 19 March 2015. The text was Mt. 2:13-23. Dear brothers and sisters of our Lord Jesus Christ: Last Sunday the historic church celebrated Mothering Sunday. Prompted by the old epistle from Galatians 4 that proclaimed the heavenly Jerusalem to be our mother (Gal. 4:26)—in other words, the Church—Christians who had moved away from home traditionally returned to the place of their Baptism, where through water and the Word they’d received a new birth and a new mother. And if along the way they happened to stop to pick some flowers to take in love to their earthly mother, who could blame them, for she was a gift of God as well. Falling closely on its heels is the Church’s way of doing Father’s Day. Joseph’s feast day came into the Western calendar in 1479, a few centuries after the golden era of Mary’s cult began; in 1870 Pius IX declared Joseph “Patron of the Universal Church”. A patron is a special kind of father. Joseph is father to us all. It took the LCMS till 2006 to get him onto our calendar, though ironically it may have been the great respect for the Virgin Mary that delayed recognition of Jesus’ earthly patron. But today we set that right. 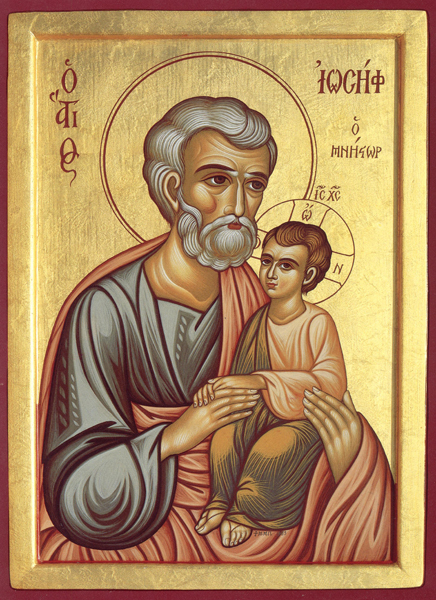 Joseph perhaps plays little more than a bit part in the Gospel story, and mainly in Matthew’s account. He “struts and frets his hour upon the stage, and then is heard no more.” His disappearance from the Gospels after the childhood narratives has given rise to much speculation. Was he an old man who had died by the time Jesus reached adulthood? This might be supported by the fact that Jesus from the cross commends Mary into John’s care. It’s consistent with the maturity he shows in Matthew 1 when faced with the revelation that his betrothed is already pregnant. If Joseph brought children from a previous marriage into his custodial care of Mary, it may explain why Jesus’ “brothers” disbelieved and despised Him. But in the present narrative, Joseph is far more than a bit player destined to disappear quickly from the stage. He’s the central instrument of God’s care for His Son. If ever there was a text that portrayed God’s use of “masks”—as Luther described it—this would be it. Nothing in the story is attributed directly to God; it’s always His servants who act. Or, to put it another way, when Joseph acts, God acts. God puts on this earthly father like a mask. 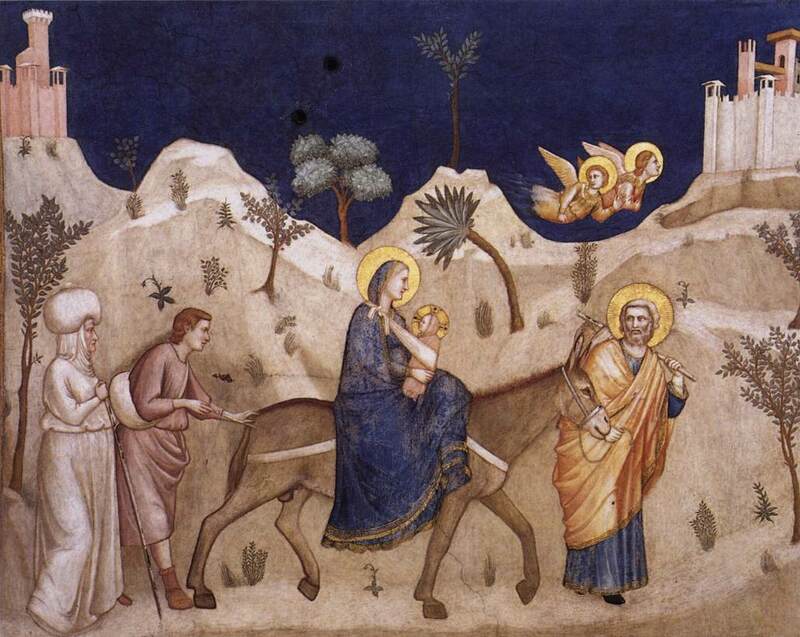 Rather than scooping Jesus out of danger with a whirlwind and a fiery chariot, rather than striking Herod dead in defence of the holy family, God sends His humble servant Joseph to lead mother and child through the dusty distance to their Egyptian refuge. While Joseph knew this journey was the will of God, thanks to the constant direction of the Lord’s angel, it took monumental faith to undertake it. Perhaps Joseph had travelled from village to village in Galilee plying his builder’s trade. He had, of course, already made the somewhat difficult journey from Galilee up to Bethlehem and Jerusalem for Jesus’ birth, circumcision, and presentation. But a trip to Egypt, the realm of Israel’s historic mortal enemy, was of an entirely different order for this simple man. It was as if, on the edge of a great storm, he were directed into the eye of the hurricane; only extraordinary trust in the person who gave him such apparently ludicrous guidance could lead him to the safety of its calm. But Joseph, against all his earthly wisdom and instinct as an experienced man, father, and husband, followed the Word of the Lord as the angel had directed him. Through the perils of the wilderness road, at the mercy of robbers and wild beasts and hunger and thirst, he led Mary and Jesus to safety in the land of his forefather and namesake Joseph. Those of us who’ve experienced such faithful fathers—or even partly faithful fathers— ought to pause and give thanks that God gives us, too, such gifts. It pleases Him to work through means. This is the way He comes down to care for us: by placing us into homes where He can wear our fathers as His earthly face. But this Gospel story isn’t truly about our fathers, and it isn’t really even about Joseph. It’s about the Word of the Lord, the Word that His angel or messenger kept bringing to Joseph in a dream. Five times in Matthew’s Gospel—and nowhere else in the NT—an angel appears in a dream to tell someone what to do, and every appearance is to Joseph. He wasn’t left alone with this monumental charge to care for the Son of God and the Blessed Virgin. His faith was in the spoken Word, and it was supported and vindicated at every step of the way. The overwhelming message of this story is that everything happens just as God would have it, and that we can trust Him to fulfil His promises. And so the Word of God punctuates this story three times to show that everything happens according to prophecy. Firstly, Matthew writes, Joseph, Mary, and Jesus travelled to Egypt “in order that what was spoken by the Lord through the prophet might be fulfilled saying, ‘Out of Egypt I have called My Son’ ” (Mt. 2:15). Now, if you read Hosea 11, it’s not at all clear that the text is a prophecy that the coming Messiah will be taken down to Egypt and returned to Nazareth. It’s part of God’s lament over His children Israel whom He loved and protected and rescued, but who responded with desertion and rebellion. “Out of Egypt I have called My son” is talking about the Exodus. So what’s it got to do with Jesus—or for that matter, with us? If this prophetic Word can be applied to Israel and to Jesus, it can only mean one thing: that Israel was wrapped up in Jesus, that in a remarkable inversion of God’s use of earthly masks, Israel for once was hidden behind and inside God. For now, finally, God had set aside His usual use of messengers and instruments, and took human flesh Himself. He acted in person, in the person of Jesus the Messiah. Where Israel, even with God’s saving hand and mighty Word, had failed, the Messiah would succeed. Jesus took up Israel in Himself and walked the road they had first trod. He went down to Egypt and returned, called back home by His Loving Father. While Israel grumbled against and rejected God’s servant Moses, Jesus subordinated Himself willingly to His father Joseph, who had led Him out of the land of Egypt and brought Him back to the Promised Land. Israel succumbed to temptation and rebelled in the wilderness; Jesus remained faithful to God’s Word and defeated the devil’s attacks. Where Israel failed to follow, Jesus picked them up and carried them back to God in His person. There’s no glory in it for Jesus, any more than there was glory in fatherhood for Joseph. It’s nothing but servanthood. In accord with the prophets who first were scorned and rejected by Israel, Jesus would suffer to be known as “the Nazarene”—a term of derision and spite. But Jesus embraces it as defining the very essence of His mission, not to win victory by power and strength but by humble submission to the consequences of taking on our every burden. Even in His resurrected glory, as Jesus continues to suffer in and with His children on earth, He wants to be known as the rejected one, declaring to Paul on the Damascus road, “I am Jesus of Nazareth whom you are persecuting” (Acts 22:8). It’s as if He were saying, “I’m the one who began My life with the shedding of blood, and with kings seeking My life, and fleeing to the land of My people’s enemies, and being scorned by the people of My own home, the people I created—all this I did because of you and for you.” The Holy Innocents who lost their lives to Herod’s great anger, who led the mothers of Bethlehem like ancient Rachel to weep for their children, were embraced by that same suffering Messiah, dying with Him long before the thief on the cross. They became like Him. And so when God looked on them He saw only Jesus, the truly Innocent One, the divine mask that hides our suffering under His blood. Today and here the Suffering Servant of Nazareth, Son of Joseph the builder, embraces us. He understands how it is for us to feel despised, ignored, trodden upon, dirty, worthless, failures, and He embraces us. He covers all that with His blood at this altar, and enters into us with His body, so that we can be what He already is, so that the Father may look down on us and say, “Out of Egypt I have called you”. For we are His sons. He not only serves us through our fathers and like a father; He makes us His children. He loves as His Son because He has hidden us inside His Son. And so by rescuing His Son Jesus from every earthly peril, from the devil’s attacks, even from death itself, He has rescued us. And to us who’ve been redeemed from Egypt He promises that we never, never, never shall be slaves again. Amen.